Funny how it works... The same week Ukrainian President Petro Poroshenko imposed martial law on much of the country, the International Monetary Fund assured him that key parameters of the 2019 budget were on track for a proposed $3.9 billion new aid program agreed to last month which is designed to help the country maintain financial stability and the trust of investors especially ahead of an uncertain election period next year. Poroshenko's press service said in a follow-up of a telephone conversation with Lagarde: "The Head of State informed Madame Lagarde about the adoption and the key parameters of the state budget of Ukraine for the year 2019. Madame Lagarde noted that, according to the IMF's preliminary estimates, the key indicators of the state budget of Ukraine are in line with the parameters agreed with the Fund." The new agreement inked in October is to span 14 months and takes the place of a prior $17.5 billion aid program from 2015 that has sought to prop up Ukraine’s war-battered economy. It is subject to Ukraine approving a 2019 budget that meets IMF requirements, with ultimate approval expected by the IMF's executive board to come later in the same year. 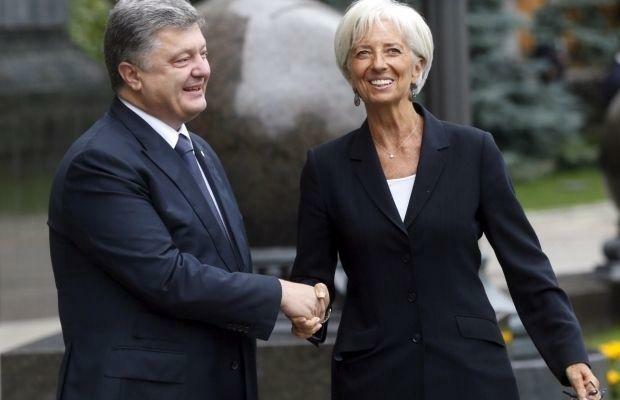 Per Kiev-based Unian's commentary of the phone call: "Madame Lagarde also confirmed the IMF's readiness to continue the good cooperation with Ukraine and to support the country in the implementation of its reforms," according to the report. On Friday, a mere two days after the "constructive" phone call with Poroshenko, the Ukrainian president announced that all Russian males ages 16-60 would be banned from entering Ukraine as part of implementation of 30 days of martial law over ten provinces. All that remains to be said is summed up in the observation of journalist Mark Ames, who aptly noted: "IMF has a funny way of always turning up with sacks of cash & photo op smiles whenever pro-western strongmen declare martial law."